The name of this component is "Text". This name shall be used when referring to this component in the COMPONENT statement (see 7.2.5.4 Component statement). This clause describes the Text component of this part of ISO/IEC 19775. Table 15.1 provides links to the major topics in this clause. Text is processed as geometry in X3D. There are special considerations when specifying text as well as when displaying text. This subclause describes the manner in which text values are specified in X3D using the Text node. 15.2.2 Text formatting describes text formatting. Textures are applied to text as follows. The texture origin is at the origin of the first string, as determined by the justification. The texture is scaled equally in both S and T dimensions, with the font height representing 1 unit. S increases to the right, and T increases up. 12 Shape component specifies how Appearance, Material and textures interact with lighting. 17 Lighting component specifies the X3D lighting equations. There is a long history of text layout and formatting. This standard specifies techniques to be used in X3D that provide support for a variety of languages and layout schemes. Additional layout functionality is specified in 36 Layout component. Font attributes are defined with the family and style fields. The browser shall map the specified font attributes to an appropriate available font as described below. In this example, the browser would first look for the font family "Lucida Sans Typewriter" on the system on which the browser is operating. If that is not available, the browser looks for "Lucida Sans". If that is not available, the browser looks for "Helvetica". If that is not available, the browser looks for any sans-serif font. If there are not sans-serif fonts installed, the browser will use any serif font (the default). It is the responsibility of the author that a suitable list of font families be specified so that the desired appearance is achieved in most operating environments. However, the author should always be willing to accept that the requested font families may not be available resulting in the use of a browser-selected "SERIF" font being used. The style field specifies a case-sensitive SFString value that may be "PLAIN" (the default) for default plain type; "BOLD" for boldface type; "ITALIC" for italic type; or "BOLDITALIC" for bold and italic type. An empty style value ("") is identical to "PLAIN". In the case where the requested style is not available, the available style that is closest to the requested style shall be used. For example, some font families specify a Demibold style rather than Bold. In this case, specifying "BOLD" will result in the browser using Demibold as the nearest substitute. The horizontal, leftToRight, and topToBottom fields indicate the direction of the text. The horizontal field indicates whether the text advances horizontally in its major direction (horizontal = TRUE, the default) or vertically in its major direction (horizontal = FALSE). The leftToRight and topToBottom fields indicate direction of text advance in the major (characters within a single string) and minor (successive strings) axes of layout. Which field is used for the major direction and which is used for the minor direction is determined by the horizontal field. Note that the direction specification overrides any modes inherent in a particular language. For horizontal text (horizontal = TRUE), characters on each line of text advance in the positive X direction if leftToRight is TRUE or in the negative X direction if leftToRight is FALSE. Characters are advanced according to their natural advance width. Each line of characters is advanced in the negative Y direction if topToBottom is TRUE or in the positive Y direction if topToBottom is FALSE. Lines are advanced by the amount of size × spacing. For vertical text (horizontal = FALSE), characters on each line of text advance in the negative Y direction if topToBottom is TRUE or in the positive Y direction if topToBottom is FALSE. Characters are advanced according to their natural advance height. Each line of characters is advanced in the positive X direction if leftToRight is TRUE or in the negative X direction if leftToRight is FALSE. Lines are advanced by the amount of size × spacing. The justify field determines alignment of the above text layout relative to the origin of the object coordinate system. The justify field is an MFString which can contain 2 values. The first value specifies alignment along the major axis and the second value specifies alignment along the minor axis, as determined by the horizontal field. An empty justify value ("") is equivalent to the default value. If the second string, minor alignment, is not specified, minor alignment defaults to the value "FIRST". Thus, justify values of "", "BEGIN", and ["BEGIN" "FIRST"] are equivalent. The major alignment is along the X-axis when horizontal is TRUE and along the Y-axis when horizontal is FALSE. The minor alignment is along the Y-axis when horizontal is TRUE and along the X-axis when horizontal is FALSE. The possible values for each enumerant of the justify field are "FIRST", "BEGIN", "MIDDLE", and "END". For major alignment, each line of text is positioned individually according to the major alignment enumerant. For minor alignment, the block of text representing all lines together is positioned according to the minor alignment enumerant. Tables 15.2-15.5 describe the behaviour in terms of which portion of the text is at the origin. The default minor alignment is "FIRST". This is a special case of minor alignment when horizontal is TRUE. Text starts at the baseline at the Y-axis. In all other cases, "FIRST" is identical to "BEGIN". In Tables 15.6 and 15.7, each colour-coded cross-hair indicates where the X-axis and Y-axis shall be in relation to the text. Figure 15.1 describes the symbols used in Tables 15.6 and Table 15.7. The language field specifies the context of the language for the text string in the form of a language and a country in which that language is used. Both the language and the country are specified using the language tags defined in 2. [RFC3066] which may specify only a country (using the three-character codes defined in ISO 3166) or both a language (using the two-character codes specified in ISO 639) and a country (using the three-character codes specified in ISO 3166) utilizing a sub-tag structure as specified in 2.[RFC3066]). The language tags contain between one and eight characters. Note that the characters used in the language tag are in the Basic Latin alphabet that maps to single-byte characters in the UTF-8 encoding. See 2 Normative references, for more information on RFC 3066 (2. [RFC3066]), ISO/IEC 10646, ISO/IEC 639, and ISO 3166. This abstract node type is the base node type for all font style nodes. The FontStyle node defines the size, family, and style used for Text nodes (see 15.2.2 Text formatting), as well as the direction of the text strings and any language-specific rendering techniques used for non-English text. See Text for a description of the Text node. The size field specifies the nominal height, in the local coordinate system of the Text node, of glyphs rendered and determines the spacing of adjacent lines of text. Values of the size field shall be greater than zero. The spacing field determines the line spacing between adjacent lines of text. The distance between the baseline of each line of text is (spacing × size) in the appropriate direction (depending on other fields described below). The effects of the size and spacing field are depicted in Figure 15.2 (spacing greater than 1.0). Values of the spacing field shall be non-negative. The Text node specifies a two-sided, flat text string object positioned in the Z=0 plane of the local coordinate system based on values defined in the fontStyle field (see 15.4.1 FontStyle). Text nodes may contain multiple text strings specified using the UTF-8 encoding as specified by ISO 10646. The text strings are stored in the order in which the text mode characters are to be produced as defined by the parameters in the FontStyle node. The text strings are contained in the string field. The fontStyle field contains one FontStyle node that specifies the font size, font family and style, direction of the text strings, and any specific language rendering techniques used for the text. If no FontStyle node is specified by the fontStyle field, the default values of the FontStyle node are used. The maxExtent field limits and compresses all of the text strings if the length of the maximum string is longer than the maximum extent, as measured in the local coordinate system. If the text string with the maximum length is shorter than the maxExtent, then there is no compressing. The maximum extent is measured horizontally for horizontal text (FontStyle node: horizontal=TRUE) and vertically for vertical text (FontStyle node: horizontal=FALSE). The maxExtent field shall be greater than or equal to zero. The length field contains an MFFloat value that specifies the length of each text string in the local coordinate system. The length of each line of type is measured horizontally for horizontal text (FontStyle node: horizontal=TRUE) and vertically for vertical text (FontStyle node: horizontal=FALSE). The length and maxExtent fields thus refer to local coordinate units along the dimension of type flow (major axis). If the string is too short, it is stretched (either by scaling the text or by adding space between the characters). If the string is too long, it is compressed (either by scaling the text or by subtracting space between the characters). If a length value is missing (for example, if there are four strings but only three length values), the missing values are considered to be 0. The length field shall be greater than or equal to zero. Specifying a value of 0 for both the maxExtent and length fields indicates that the string may be any length. When the default values of length and maxExtent are used, the Text node shall generate events called origin, lineBounds and textBounds to provide applications with spatial data regarding the size and position of the rendered string(s) with the font being used. These events are also generated when the default values of length and maxExtent are used and the text is redrawn (e.g., the string field is changed programmatically or the FontStyle node is replaced). The field origin is a single 3D position that specifies the origin of the text local coordinate system in units of the coordinate system in which the Text node is embedded. The value of the origin field represents the upper left corner of the textBounds. The field lineBounds is a set of 2D vectors where each vector contains the size of the 2D bounding box for each line of rendered text in local text x and y units. The textBounds event is a single 2D vector that contains the size in x and y dimensions of the Text node’s 2D bounding box (all strings) as rendered. An example for each value of the topToBottom of the FontStyle node is depicted in Figure 15.3. Through the origin event, authors can locate relative measures of lineBounds and textBounds regardless of the FontStyle's major or minor axis. 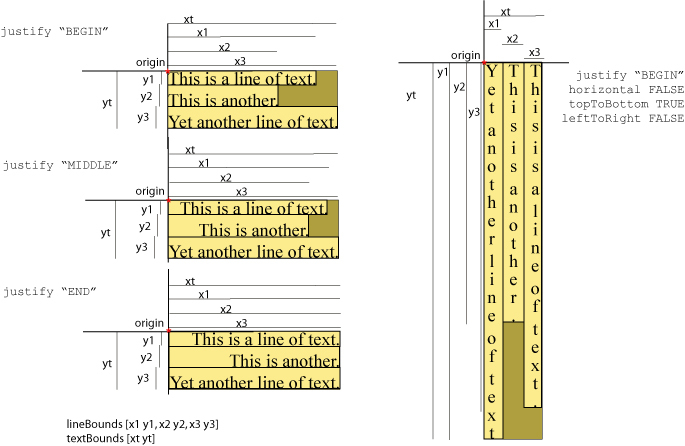 NOTE In horizontal font styles, the x dimension of the lineBounds and textBounds fields is equivalent to a specified length or maxExtent (the major axis). However, in vertical font styles, the x dimension of the lineBounds and textBounds fields is along the minor axis. 11.2.3 Common geometry fields provides a complete description of the solid field. The Text component provides 1 level of support as specified in Table 15.8. FontStyle All fields fully supported. Text All fields fully supported.